Unsure of how to become a Christian? Written for any age, Bridge to Life will explain to you how to bridge the gap between you and God. Unsure of how to explain the Gospel to a child? The Wordless Book is used the last weeks of both curriculum. Using simple terms, this plan is written to give you exact words to use when talking to a child. Also read the ABC's of Salvation. A Heart for Jesus by Juanita Bynum is a book that specifically explains in childlike terms what it means to "give your heart to Jesus." 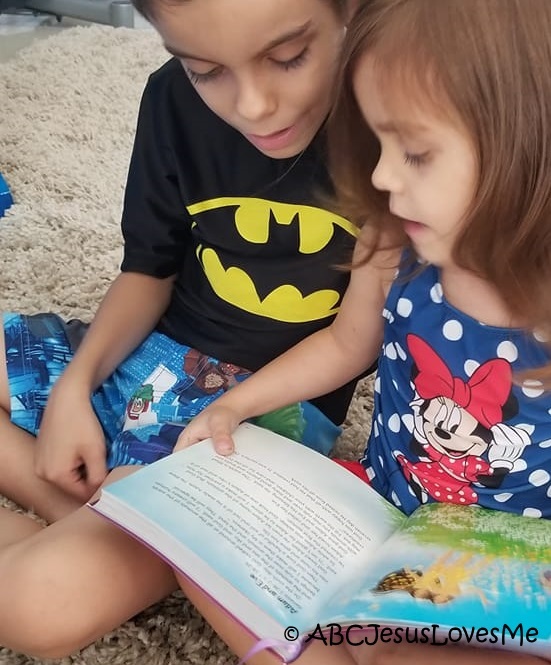 The book contains a prayer for a child to pray to ask Jesus to make their hearts new and clean. The Jesus Book by Stephen Elkins explains the Who, What, When, Where, and Why of Jesus. Answered are questions such as "Why did Jesus die on the cross for me?" and "How do we receive eternal life?" I Believe In Jesus: Leading Your Child To Christ by John McArthur tells the story of God's plan of salvation from creation through the life, death and resurrection of Christ. If you have questions about beginning a personal relationship with Jesus Christ, please email me. I don't know all of the answers but I would love to explain how easy it is to bridge the gap between you and God. If you decide to accept Jesus' free gift of eternal life, please let me know. I would love to know that you made this decision. Your name will not be posted in anyway. I would just like to rejoice in your salvation with my new brother or sister in Christ. 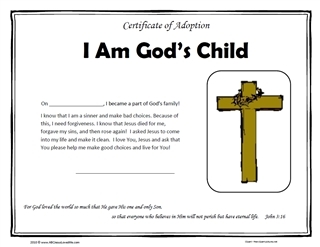 Print a Certificate of Adoption to hang on the wall declaring the day that you or your child became part of God's family!